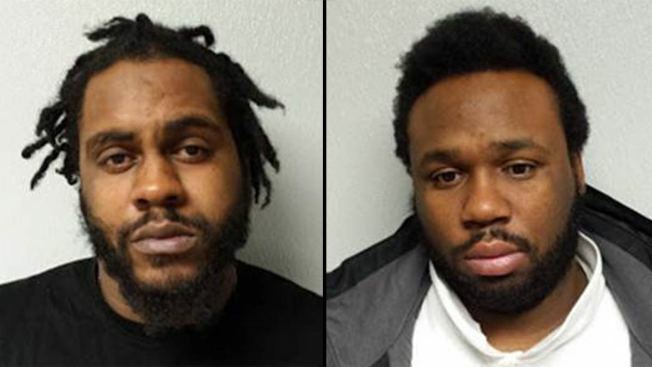 Taqwa Muhammad (L) and Deangelo Eric Garris (R) have been arrested in the death of a Leesburg man, Prince George's County Police announced Thursday. Two suspects have been arrested in the killing of a Virginia man who was once convicted of scamming banks out of more than $53 million. The body of Osama El-Atari was found Saturday afternoon in a pickup truck in Upper Marlboro, Maryland. He had been shot. Deangelo Eric Garris, 29, and Taqwa Muhammad, 26, have been arrested in his death, Prince George's County Police announced Thursday. Detectives believe Garris, of Waldorf, and Muhammad, of Lusby, targeted the victim and robbed him of several items. They then shot him and fled, police said. The suspects are both charged with first-degree murder and second-degree murder. El-Atari, 37, of Leesburg, had been reported missing by his family last week. A former restaurant owner, El-Atari was convicted in 2010 for scamming banks out of more than $53 million. He presented fake life insurance policies claiming cash values in the millions as collateral for loans from banks in Virginia, Ohio, Tennessee and Maryland, according to the U.S. attorney's office. Phony domain names, emails and Federal Express mailings supported his fraudulent claims. El-Atari flaunted his millions, living a lavish lifestyle, the FBI said. He bought Lamborghinis and Ferraris and a multimillion-dollar home in Ashburn. He served only four years of his sentence after working as an informant and testifying in two high-profile cases.